Synopsis: "Now what you hear is not a test/I'm rapping to the beat!" Gordon wants to learn how to rap to the beat, thinking it will get him respect, admiration, and maybe his latest high school crush. What he doesn't know is his journey to learn how to rhyme will take him not just deeper into Hip-Hop, but deeper into his legacy and his true purpose. Based on true events, NSangou Njikam takes you into the world of the Emcee, using Hip Hop performance aesthetics like beatboxing, movement, and a live freestyle battle to discover what it takes to really freestyle rap. Syncing Ink follows the journey of a young man struggling to master his Word power, learn the elements of the art of Rhyming, and ultimately wield his Words to save the life of his most important mentor. Artistic Statement: The quality of the work and the presence of an original and exciting voice is reason enough to produce the play, but we were also eager to include it in the season because it is not like the other shows the Alley Theatre generally presents. As we enter the next chapter of the Alley Theatre, following a massive renovation completed last year, we want to expand the notion of what the Alley does. The commitment to new writing and the launch of the annual Alley All New Festival is part of that. And presenting this fantastic piece of Hip-Hop theatre in our subscription season will be another way to show that the Alley’s artistic vision is expanding. Grant Statement: Funding from the Edgerton Foundation will underwrite an additional week of rehearsal for the world premiere production of Syncing Ink. At the Alley, the development process will be overseen by our Artistic Director, Gregory Boyd, along with Elizabeth Frankel, Director of New Work. Elizabeth worked on the piece from its inception when NSangou wrote the play while in the Emerging Writers Group at The Public Theater, a program she ran before joining us at the Alley. In the months leading up to the Alley All New festival, Elizabeth worked closely with NSangou and Director Niegel Smith, reading multiple drafts and sharing feedback. This process will continue through the rehearsals and opening night at the Alley. Niegel Smith, Artistic Director of The Flea as well as the play’s Director, has a keen dramaturgical eye and strong sense of how to shape the piece as well as how to bring it to vibrant life on stage. Synopsis: Emma becomes an instant outcast—and a national headline—when her high school cancels the prom rather than let her attend with her girlfriend. Sensing a chance to correct an injustice—and maybe get some good publicity along the way—a group of fading celebrities takes up the cause, and invades Emma's small Indiana town. But their bumbling attempts at social activism make the situation far worse than they—or Emma—could have ever imagined. Cultures clash and the town erupts in chaos. The community's reputation, Emma's future, and the actors' careers all hang in the balance, until a true hero emerges to save the day. Uproarious and ultimately uplifting, this new musical proves that standing up for yourself—and inspiring others to accept their differences—can make you the star you were always meant to be. Artistic Statement: The incredible story and mass appeal of The Prom guarantees its long life on the American stage. In post-marriage-equality America, The Prom offers a hilarious yet unflinching look at the difficulties that still face many gay and lesbian members of our society, while fully celebrating their recent victory. School bullying, harassment, systemic civil rights violations, and the challenges of coming out and owning your identity are front and center in this play. But as the audience watches Emma navigate these challenges, what emerges is also a heart-warming coming of age story about falling in love for the first time and just being a teenager who wants a magical night at her high school prom. 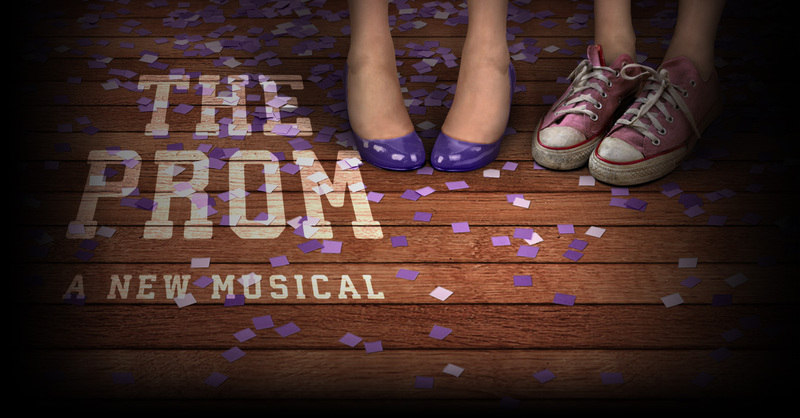 The Prom is also a play about the ongoing struggle to find your place and purpose in adult life. In the midst of our fading celebrities' bumbling and unwanted attempts to help Emma's situation is the story of older women and queer-identified individuals working to protect their hard won rights for a younger generation. We also see parents struggling to reconcile what they feel is right for their children with the momentum of history, and we witness the essential role of educators in our communities as we watch the careful attempts of the principal to bring a divided community together. A comedy about growing up and being grown, New York and the Midwest, identity and community change, The Prom has something for everyone. Cast: Mary Antonini, Brooks Ashmanskas, Anna Grace Barlow, Courtenay Collins, Collins Conley, Demarius R. Copes, Keven Csolak, Shelby Finnie, Damon J. Gillespie, Sheldon Henry, Caitlin Kinnunen, Clayton Landley, Beth Leavel, Becca Lee, Chris Medlin, Martin Moran, Angie Schworer, Christopher Sieber, Brendon Stimson, Teddy Toye, and Michelle West.